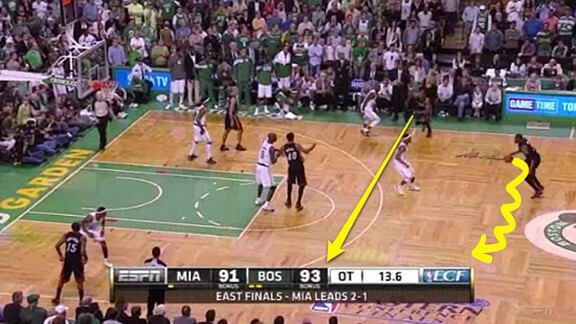 » How Did the Heat Botch Their Final Possession? 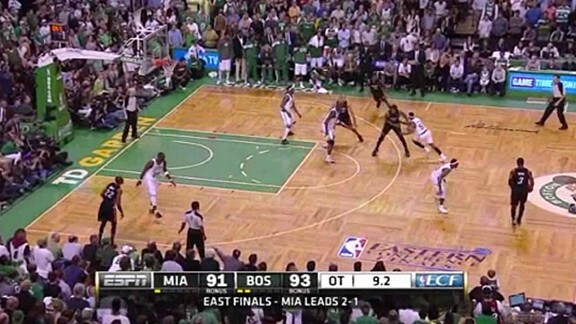 At the end of overtime in Sunday’s Game 4, the Miami Heat were down by two points with 14 seconds left. 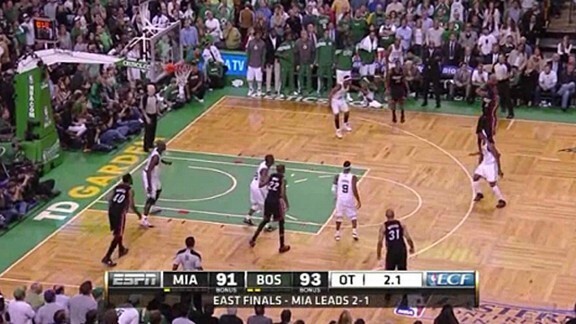 With LeBron James on the bench after fouling out, Dwyane Wade took the final shot. Make no mistake though: This was not a designed isolation play. Coach Erik Spoelstra drew up a great misdirection play to get an open 3-point shot for Mario Chalmers, but because of Wade’s poor execution, they settled for their second option and Wade missed the 3. This play begins with James Jones inbounding from the side. Chalmers, who is defended by Keyon Dooling, curls out to the weakside corner as if he is providing a spacing option. As soon as Chalmers clears Shane Battier and Udonis Haslem, they set staggered pin-down screens for Wade to ensure that he gets the ball near half court — though the screens were unnecessary because Boston let him get it easily. After inbounding the ball, Jones sprints to the opposite wing. At the same time, Wade dribbles, moving parallel to Jones as he moves without the ball. Meanwhile, Chalmers is still in the corner. Once Wade gets to the opposite side of the court, Chalmers sprints on a straight line across the court, through the paint, in between two screens set by Battier and Haslem. They are both on the wing. As Chalmers moves through the screens, Dooling decides to unattach himself. Instead he shoots the gap of the double screen, going over the top and getting in the passing lane. 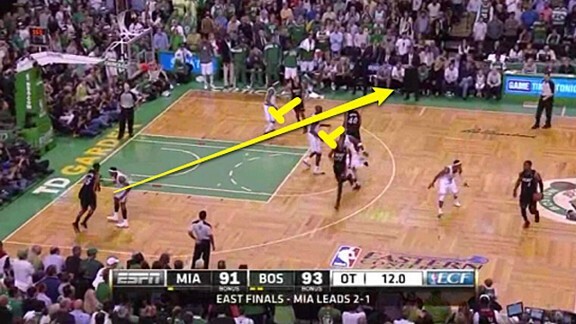 If something looks off here, it should: Miami’s spacing is very poor. Wade was supposed to get to the opposite side of the court where he caught the ball, and as Chalmers cut, Wade was supposed to cross over and take a hard dribble or two back toward Chalmers. 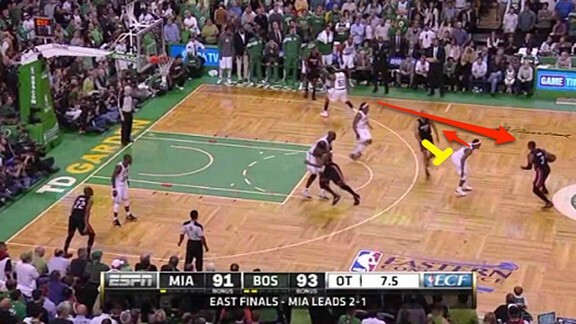 Instead, Wade crosses over lazily, and doesn’t work hard to bring the basketball back toward Chalmers. Chalmers is open, but because Wade didn’t move back toward the action, Wade can’t get the ball to him. There was not a good pass option, but it was Wade’s job to make the angles work and to give himself a chance to make the pass. There was a second chance for Wade to make the pass to Chalmers. With Dooling working over the top, Chalmers flares out toward the corner. Again, if the angle had been better (and that poor angle is a result of Wade not executing), there would have been an easy pass over the top of Dooling’s hands to Chalmers for a 3-point attempt and a shot at the win. At that point there were nine seconds left on the shot clock, so if Chalmers had gotten a shot off, they had a chance for an offensive rebound. Spoelstra prepared for the possibility that Chalmers would not make the catch (though they probably thought the cause would be Boston’s defense). 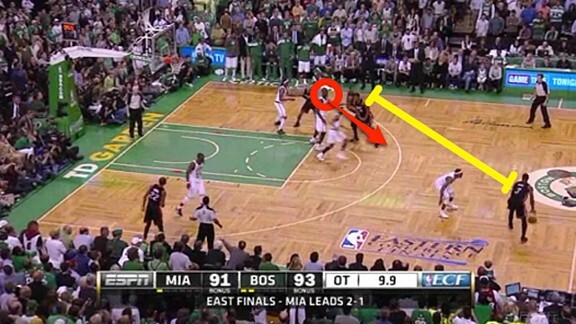 After Chalmers doesn’t make the catch, he spaces out toward the corner while Haslem sprints to the opposite corner. Battier comes up and sets a screen for Wade. 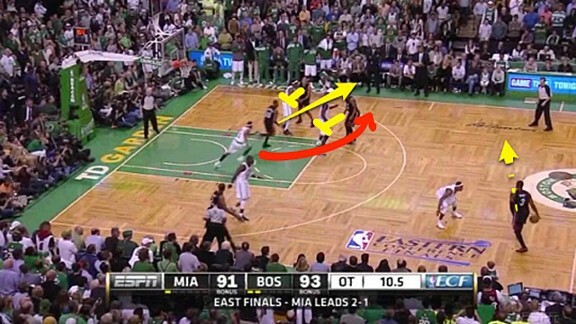 This forces a defensive switch, with Rajon Rondo picking up Battier and Marquis Daniels guarding Wade. When you watch it live, Wade’s poor timing and positioning are obvious. The significance of James fouling out cannot be understated. The ball is usually in James’s hands at the ends of close games, and this play illustrates why. 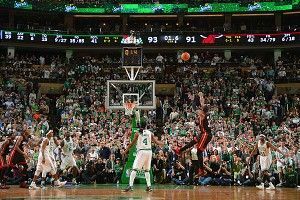 If Wade had changed directions and dribbled hard back to the action, he could have created a much better passing angle. You can’t really argue with the decision to go for the win instead of the tie. Since they were on the road, James had fouled out, and Wade had played every minute of the second half and overtime, they needed to win it with one more shot. Wade’s shot was not the best they could have had. We have seen Spoelstra trust his other guys in a number of late-game situations, and it works because teams don’t expect it. 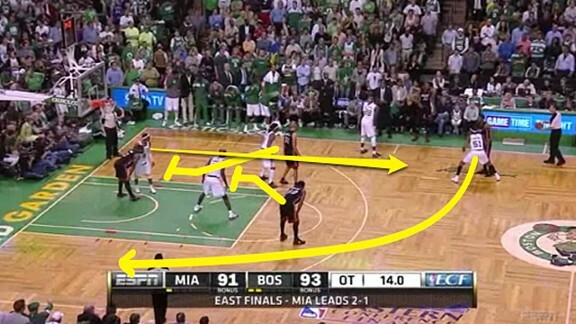 That’s what happened here, but the Heat were unable to turn that set into a great look.